The school that a pupil attended remains a bigger factor in whether they get into a top university than having good A-level grades, research suggests. The Sutton Trust charity, which analysed admissions from 2002-06, says state school youngsters are losing out. The trust found the number of pupils at the top 30 comprehensives who went to Oxbridge was just a third of what might be expected if based on ability. 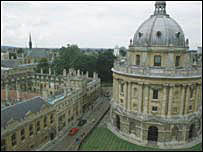 But at the top 30 independent schools, more than expected got Oxbridge places. The Sutton Trust is committing at least £10m over the next five years to lift the chances of youngsters from disadvantaged backgrounds. It wants others to "join the cause", both financially and by coming up with innovative schemes. It is also investigating how it can help state schools where the average A-level (or equivalent) score is high but the access to the top universities is relatively low. The "Sutton 13" research-led universities the trust cites in its reports are Cambridge, Imperial College London, Oxford, the LSE, University College London, York, Warwick, Bristol, Nottingham, St Andrews, Birmingham, Edinburgh and Durham. For this latest study it analysed admission rates between 2002 and 2006 involving more than one million students from 3,700 UK schools and colleges. More than 80% of these elite schools are in the independent sector. Sutton Trust chairman Sir Peter Lampl said: "It is deeply worrying - not to mention a sad waste of talent - that the chances of reaching one of these highly selective universities are much greater for those who attend a small number of the country's elite schools, mainly fee-paying. "Where does this leave the vast majority of the population who do not have access to these opportunities?" Researcher Lee Elliott Major said the "killer fact" was that the top 30 independent schools had twice the numbers going to Oxbridge than the top 30 grammar schools. Sir Peter said: "We are not saying there's any skulduggery going on." Family aspirations were obviously a key factor. Independent schools tended to prepare their students much better to cope with admissions interviews and tests. "There's a big problem with a lot of schools not encouraging kids to aim high enough." And he added: "We have a class structure, that is the very simple answer. "We actually do have a class structure and that gets in the way of trying to do something about this." Higher Education Minister Bill Rammell said: "The government is strongly committed to ensuring that every young person with the ability and potential to benefit from higher education has the opportunity to do so." The Independent Schools Council said: "We believe the problems in widening access from the maintained sector require a solution much earlier in a child's education." Universities UK president Rick Trainor said universities already did a great deal to widen access. "We agree with the point that potential students should not be disadvantaged by where they happen to go to school - raising aspirations and attainment and offering appropriate guidance while at school is key to this."